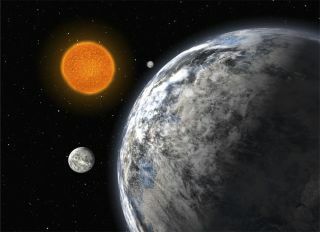 This artist's impression shows the newly discovered trio of super-Earths orbiting a sun-like star, HD 40307. A trio ofplanets called super-Earths has been spotted orbiting a sun-like star,astrophysicists announced today at an international conference in France. Super-Earthsare more massive than Earth but less massive than Uranus and Neptune. Spottingtrue Earth-sized planets is challenging with current technology, but thepresence of super-Earths suggests finding aworld like ours is just a matter of time, researchers say. The teamlocated the trio with the HARPS instrument on the European SouthernObservatory's 3.6-meter telescope at La Silla, Chile. They inferred theexistence of the planets by noting the worlds' gravitational affects on theparent star's orbit. This method is called the radial velocity, or wobble, technique. Inaddition, HARPS astronomers have tallied about 45 new candidate planets with amass below 30 Earth masses and an orbital period shorter than 50 days. Theresearchers say the deluge implies one out of every three sun-like stars harborssuch planets. "Wehave made very precise measurements of the velocity of the star HD 40307 overthe last five years, which clearly reveal the presence of three planets," saidteam member Michel Mayor of the Geneva Observatory in Switzerland. Thesmallest of the trio weighs in at 4.2 Earth masses and orbits HD 40307 every4.3 Earth days, while the largest, with a mass 9.4 times that of Earth, has a 20.4-dayorbit. The middleweight is 6.7 Earth masses and has a 9.6-day trek around thestar. Since Mayor's1995 discovery of a planet around the star 51 Pegasi, astronomers have noted morethan 270 extrasolar planets, mostly around solar-like stars. Most of theseplanets are gas giantscalled "hot-Jupiters." The researchers say about one out of every 14stars outside our solar system harbors a hot-Jupiter. A basketfulof other newexoplanets also got the spotlight at the same international conference, whereresearchers focused on extra-solar super-Earths. A duo orbiting the star HD 181433: a super-Earth (7.5 Earth masses) that orbits its star every 9.5 days, and a Jupiter-like planet with a nearly three-year period. ? Two planets, a 22 Earth-mass planet having a period of four days, and a Saturn-like planet with a three-year period. "It ismost probable that there are many other planets present: not only super-Earthand Neptune-like planets with longer periods, but also Earth-like planets thatwe cannot detect yet," said team member St?phane Udry, also of the GenevaObservatory. "Add to it the Jupiter-like planets already known, and youmay well arrive at the conclusion that planets are ubiquitous."